A copy of a late-Mannerist gold cup that was once in the possession of the Rospigliosi family in Rome, this object was formerly attributed to the Italian goldsmith Benvenuto Cellini. To most of us today the name Peter Carl Faberge conjures up memories of the extravagance and whimsicality enjoyed by a doomed society. It is impossible to think of him without recalling the surprise Easter Eggs and bejeweled mechanical trifles that he made to amuse the last of the Romanovs. We look at his work with mingled emotions. Inevitably, one yields to the fascination of gold and precious stones, and one is caught by the spell of his intricate craftsmanship. Yet for many of us there is an added interest, the tragic fate suffered by the Romanovs. Their costly indulgences symbolize, at least in part, one of the causes of their downfall. Although Faberge’s works may strike some eyes as highly capricious, they belong to a well-established tradition of European goldsmith work — going back at least four centuries. 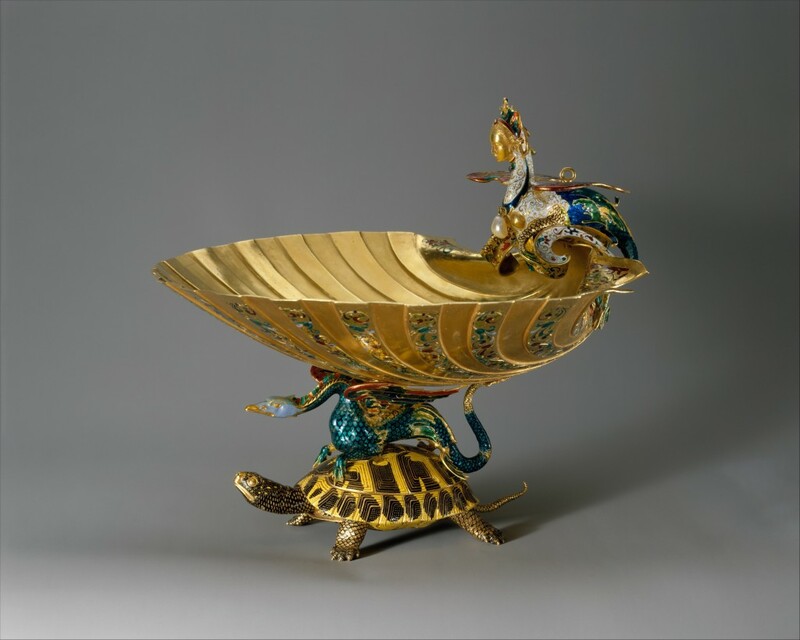 His fanciful combinations of priceless jewels, enamelling, and beaten gold find parallels, for example, in the famous Rospiglioso Cup in the Metropolitan Museum of Art or in Benvenuto Cellini’s salt-cellar, made for Francois I of France and now in the Kunsthistorisches Museum, Vienna. Like other monarchs, Francois I took special delight in highly ornamental decorative works. He also had a taste for the bizarre. According to Giorgio Yasari. “When Leonardo was at Milan the King of France (Francois I) came there and desired him to do something curious; accordingly he made a lion whose chest opened after he had walked a few steps, discovering himself to be full of lilies.” It is not known if Leonardo’s lion was made of gold, but the idea of a mechanical contraption concealing a surprise brings many of Faberge’s creations to mind. 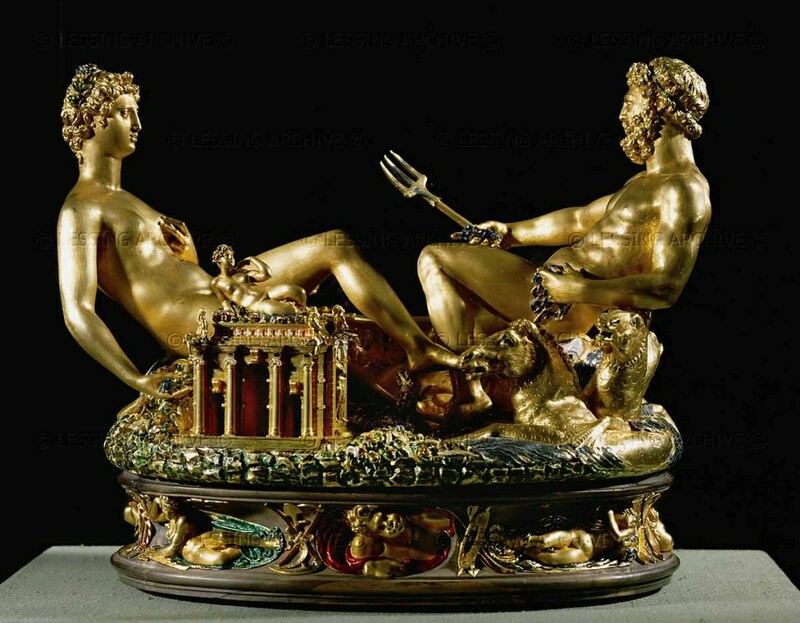 Benvenuto Cellini Saliera or Salt Cellar, 1540-1543 in Paris. Gold, covered in part by enamel; base: ebony. Faberge’s link with the Renaissance is not fortuitous. He actually made copies after the work of Renaissance goldsmiths in order to impress his patrons with his abilities. The egg presented in 1894 by Alexander III to Maria Feodorovna is modelled painstakingly after an egg-shaped casket now in the Grimes Gewolbe Museum at Dresden. The casket was made in the late seventeenth century by Le Roy, a goldsmith working in Amsterdam. 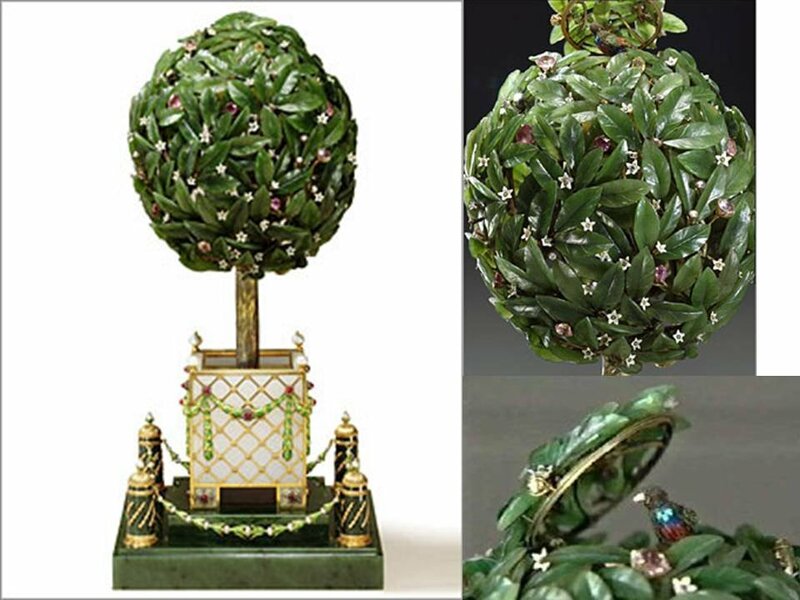 Differing from the original only in minor details, Faberge’s copy is a tour de force and it is constructed, of course, to contain a mechanical surprise which unfortunately no longer survives. 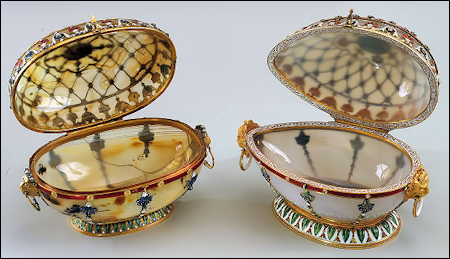 The art of Faberge is also deeply indebted to the great eighteenth-century French goldsmiths, who produced snuff boxes and other objets d’art for Louis XVI and the aristocratic society surrounding him. There is a striking example of Faberge’s skill in reproducing the style of a bygone epoch. A gold snuff box is based directly upon a French box, which was housed in the Winter Palace in Faberge’s time. Even his miniature sets of furniture, made from gold and semiprecious stones, are reproductions of earlier styles. Faberge’s involvement with the past sets him apart from his contemporaries in Western Europe and America. Even in his time his works were not in any sense modern. To name the most prominent practitioners of the goldsmith’s art during his lifetime underscores his individuality. The Americans, Charles Lewis Tiffany (1812-1902). and his son Louis Comfort Tiffany (1848-1933), for instance, or the Frenchmen, Lucien Falize (1838-1897) and Rene Lalique (1860-1945) produced works in the Art Nouveau style. Charles Robert Ashbee (1863-1942), on the other hand, was one of the leaders of the Arts and Crafts movement in England. Georg Jensen (1866-1935), a Danish gold and silversmith, and Joseph Maria Olbrich (1867-1908). a German architect who designed metalwork in the Jugendstil, likewise achieved international recognition for their modern styles. 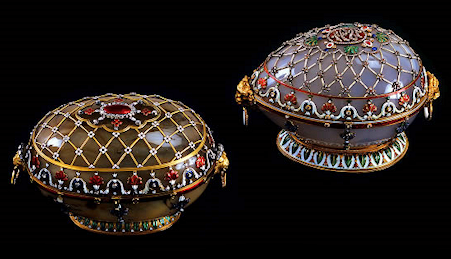 Working in Russia for an autocratic society, Peter Carl Faberge created examples of the goldsmith’s art that looked back to the past and by association connected the Czar with his European predecessors. Orange Tree Egg created for Nicholas II of Russia who presented the egg to his mother, the Dowager Empress Maria Feodorovna. 1911. Yeats added a note to his poem, saying that “I have read somewhere that in the Emperor’s palace at Byzantium was a tree made of gold and silver, and artifical birds that sang.” One might add that just such a tree with a singing bird was made in 1911 for Nicholas II of Russia.